Pas de Quatre is a romantic ballet with music by Cesare Pugni and choreography by Jules Perrot. It premiered at Her Majesty's Theatre in London on 12 July 1845. The critics raved. The ballet was created for the four great ballerinas of the age: Marie Taglioni, Carlotta Grisi, Fanny Cerrito, and Lucile Grahn. The ballet was given four performances. Queen Victoria and Prince Albert attended the third performance. 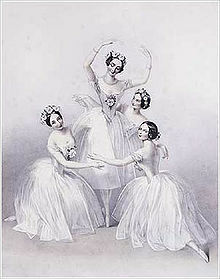 It was thought that the four great ballerinas would never consent to appear on stage together. They were very jealous and extremely competitive. It was only through the tactful persistence of Benjamn Lumley, the manager of the theatre that the ballet was realized. Fanny Essler was one of the great ballerinas of the age, but not invited to participate because she was Taglioni's greatest rival. She had threatened to dance Taglioni's signature piece La Sylphide. Lincoln Kirstein. 1984. Four Centuries of Ballet: Fifty Masterworks. Dover. pp. 158–9. This page was last changed on 12 March 2013, at 18:36.